Jim Turner of The Jim Turner Band is a well-known East End musician who has recently been traveling and performing in “England, Florida, Tennessee and New York City." Turner reports he has enjoyed being on the road and is always happy when “The season comes back to life. I look forward to playing a lot of gigs." He began his set with a crowd-pleasing tune “Hampton Bound," a playful, revealing spin on what we can all expect during the high tourist season. Another noteworthy tune, “Mean Old World," which Turner described as a “standard blues classic," revealed the consummate musicianship of this talented group, particularly Turner's smooth harmonica playing. Finishing their set with a rowdy cover of Led Zeppelin's “Rock 'n Roll," The Jim Turner Band got the crowd on their feet leaving vacant chairs and abandoned cocktails while the floor filled with dancers totally in tune with Turner's song selections. 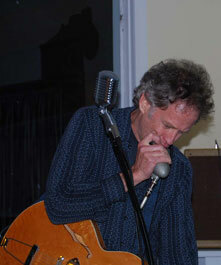 You can visit Jim Turner's website at www.jimturnermusic.com. 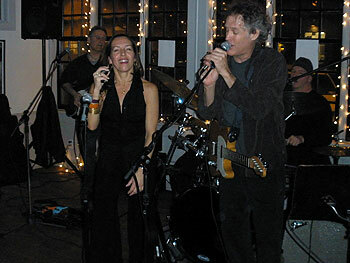 Members of The Jim Turner Band performing on Saturday night included James Benard of Hampton Bays on drums; “Clutch" of Riverhead on bass; and Joel Kraus of Asbury Park, NJ on vocals and guitar. All are independent and studio musicians who have played with Turner numerous times over the years. “Performing on the East End and in the Hamptons is always a great gig as 17 weeks over the season can pay for the winter," Clutch commented. All three musicians agreed, “This is a passion, profession and vocation so we'll travel to where the gigs are." Turner, a Sag Harbor resident, who has always maintained a select “handful of students that I teach music to because it empowers my own knowledge," made his usual connection to the audience.